View from the top of Brimstone Hill Fortress and National Park. Image courtesy of the St. Kitts Tourism Authority. There’s much more to the Caribbean isle of St. Kitts than beautiful beaches. Without question, casual tourists who overlook the history of the region miss out on important cultural milestones and attractions such as Brimstone Hill Fortress, the ruins of the oldest rum distillery in the Caribbean and a historic square that was once the hub of slave trade in the Lesser Antilles, to name a few. Arguably, the most stunning attraction on the island is Brimstone Hill Fortress and National Park. This 37-acre park is a UNESCO World Heritage Site and one of the best-preserved fortifications in the Caribbean. St. Kitts was the first island in the Caribbean to be settled by both the French and British, both of whom transported slaves from Africa to work in sugar plantations and other labor-driven industries. A lot of money and power was at stake during the Colonial period of the 17th and 18th centuries, and this imposing fortress was built on the backs of slaves to protect the island from opposing forces who would attack by sea. Originally called Pall Mall Square, Independence Square became the administrative, commercial and social center of Basseterre—the capital of St. Kitts and Nevis—beginning in 1750. It was also ground zero for slave trade in the region. Slave ships would dock at the nearby port, and the slaves they brought with them would be imprisoned in the basements of the buildings that encircled the square. When the time came, slaves who were in good health would be auctioned at Independence Square, their fate forever changed. Parents were often separated from their children, lovers split apart. They might end up on other Caribbean islands, working the sugarcane fields, or perhaps across the ocean, harvesting tobacco or cotton in plantations throughout the U.S.
One of the old windmills still to be found on St. Kitts. Image courtesy of the St. Kitts Tourism Authority. With the abolishment of slavery throughout the British colonies in 1834 and numerous other factors, the sugarcane and rum industries eventually collapsed in St. Kitts and elsewhere in the Caribbean. 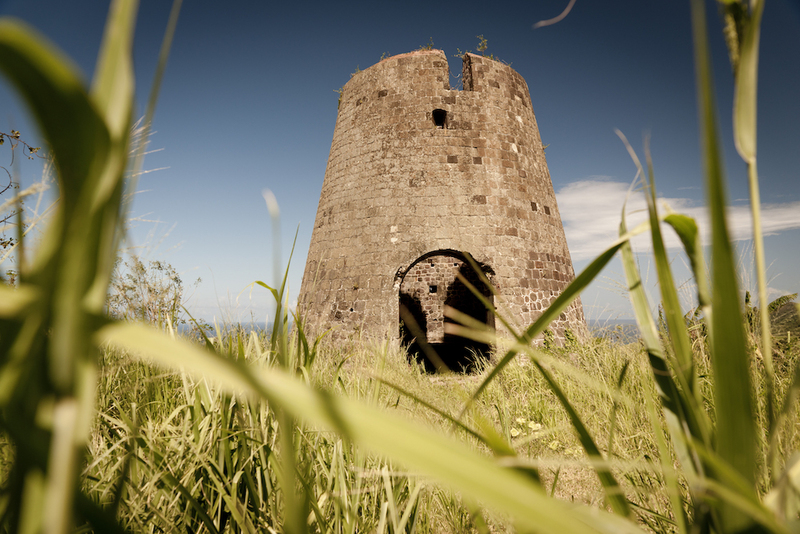 Evidence of this economic shift can be seen in the form of ruins across the island, including the St. Kitts Sugar Factory and Compound, the Belmont Estate Yard and Wingfield Estate—the oldest rum distillery in the Caribbean. One particularly interesting vestige of Colonialism is the St. Kitts Scenic Railway, which was originally built to transport sugar cane from the plantations to the sugar factory in Basseterre. It has been transformed into an informative three-hour, all-you-can-drink tour of the island, complete with coral singers who preform folk songs. While the rails are bumpy and the train ride is about twice as long as it needs to be, the St. Kitts Scenic Railway offers some truly stunning views that would be difficult (and in some cases damn near impossible) to see any other way. The famous black rocks of St. Kitts. Image courtesy of the St. Kitts Tourism Authority. My trip to St. Kitts was made possible by the St. Kitts Tourism Authority. Views expressed are my own.